The IRS expects that more than 70% of taxpayers will receive a refund in 2017. What you do with a tax refund is up to you, but here are some ideas that may make your refund twice as valuable. Perhaps you’d like to use your tax refund to start an education fund for your children or grandchildren, contribute to a retirement savings account for yourself, or save for a rainy day. A financial concept known as the Rule of 72 can give you a rough estimate of how long it might take to double what you initially save. Simply divide 72 by the annual rate you hope that your money will earn. For example, if you invest your tax refund and it earns a 6% average annual rate of return, your investment might double in approximately 12 years (72 divided by 6 equals 12). If stashing your refund away in a savings account or using it to pay bills sounds unappealing, go ahead and splurge on something for yourself. But remember, you don’t necessarily have to spend it all. Instead, you could put half of it toward something practical and spend the other half on something fun. The IRS makes splitting your refund easy. When you file your income taxes and choose direct deposit for your refund, you can decide to have it deposited among two or even three accounts, in any proportion you want. Qualified accounts include savings and checking accounts, as well as IRAs (except SIMPLE IRAs), Coverdell Education Savings Accounts, health savings accounts, Archer MSAs, and TreasuryDirect online accounts. To split your refund, you’ll need to fill out IRS Form 8888 when you file your federal return. Using your refund to pay down credit card debt or a loan with a high interest rate could enable you to pay it off early and save on interest charges. The time and money you’ll save depend on your balance, the interest rate, and other factors such as your monthly payment. Here’s a hypothetical example. Let’s say you have a personal loan with an $8,000 balance, a 12% fixed interest rate, and a 24-month repayment term. Your fixed monthly payment is $380. If you were to put a $4,000 refund toward paying down your principal balance, you would be able to pay off your loan in 12 months and save $780 in interest charges over the remaining loan term. Check the terms of any loan you want to prepay, though, to make sure that no prepayment penalty applies. Giving to charity has its own rewards, but Uncle Sam may also reward you for gifts you make now when you file your taxes next year. If you itemize, you may be able to deduct contributions made to a qualified charity. You can also help your favorite charity or nonprofit reap double rewards by finding out whether your gift qualifies for a match. With a matching gift program, individuals, corporations, foundations, and employers offer to match gifts the charitable organization receives, usually on a dollar-for-dollar basis. Terms and conditions apply, so contact the charitable organization or your employer’s human resources department to find out more about available matching gift programs. How long will you have to pay for private mortgage insurance? 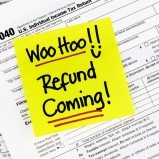 Be the first to comment on "Four ways to double the power of your tax refund"